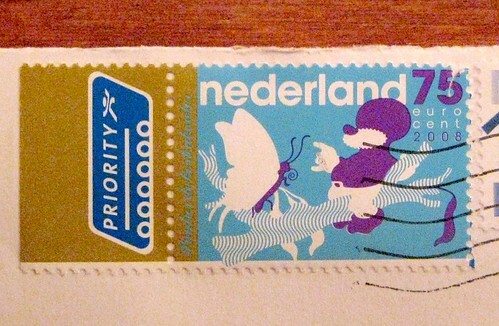 This fine stamp came from a correspondent in the Netherlands. Is there a story behind this, I wonder, or is it just a cute little gnome sitting on a branch, reaching out to a butterfly? I can't read the words that are on their side by Priority. that is awesome my dear Have a great day and or evening . take care and thanks for sharing and posting this . I love your blog and read it everyday, so thanks for that. That's a funny looking stamp, even for the Dutch. I saw that OOOOO on the side of an airmail stamp the other day, on someone's online collection, which I have now lost the bookmark to; I was wondering about it as well. The quote by Shakespeare the other day is from J. Caesar, I think. PS. You should get a crazy snail mail any day now! Jonathan, thanks for the compliments! Also, thanks for the tip on the Shakespeare quote. The text I can read on this stamp is not the OOOOO but it's smaller, in blue-green cursive on the yellow/green background, just before the perforation between the two stamps. It's probably pretty blurred in this photo. 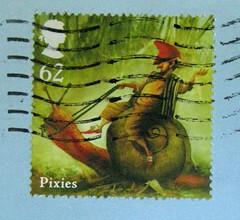 Thesse stamps are Dutch gnomes from Dutch stories. The words besides Priority say: Paulus the Boskabouter. He was a famous Gnome during my childhood who had his own tv show. Puppets on a string and very laughable when I see it now but it was awesome in these days being a little kid. Pinkeltje; De Kabouter (by Rien Poortvliet); Wipneus en Pim and Piggelmee .